Hashim Thaçi was the first Prime Minister of the Republic of Kosovo since it unilaterally declared independence from Serbia in February 2008. 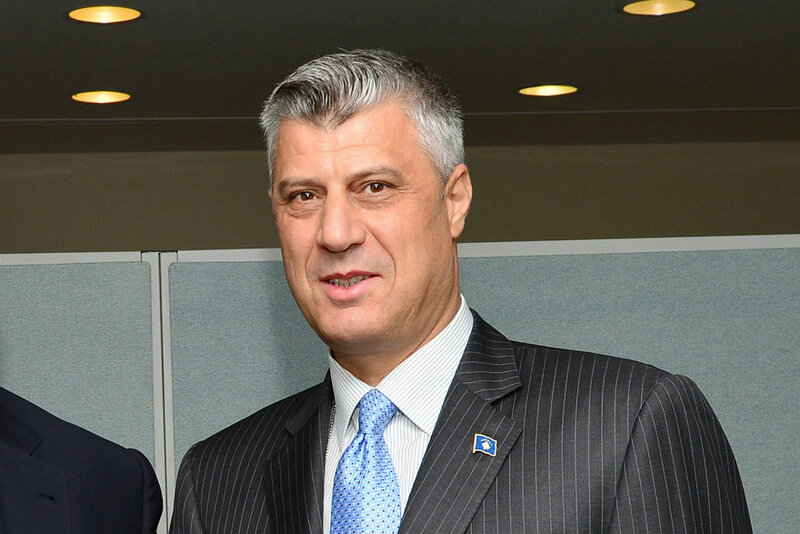 Since December 2014, Thaçi has served as Kosovo’s Foreign Minister and Deputy Prime Minister and has also been chairman of the Democratic Party of Kosovo (PDK) when it was founded in the year 2000. Thaçi was a co-founder and leader of the Kosovo Liberation Army (UÇK), a paramilitary organisation that operated during the Kosovo War. He spoke to EURACTIV Germany’s Chief Editor, Daniel Tost. 17 February 2015 marks the seventh anniversary of Kosovo’s independence. How would you describe the current situation in the country? Kosovo was never more free and the Balkan states have never lived together in peace before. We have had an average of 4% economic growth during the years of independence, while foreign debt was the lowest in Eastern Europe. Over 80% of the population is connected to the Internet via broadband, and over the last 7 years we have built 1,500 KM of roads and 100 schools. But this is not enough. Now Kosovars want European standards fast, and they are tired of the economic transition. Economic growth has not created enough jobs for young people. That is why there is much to do. The proverbial glass is half full now. It simply needs much more. Kosovo is considered the poorest country in Europe. Corruption, poverty and conflict with the Serbian minority seem to define the country’s image. Is this image accurate? No. The realistic image is not that of bad news. From Athens to Ljubljana, there are many complaints and many economic problems. But if one compares Kosovo with where it was 15 years ago, in a terrible war and genocide, or with 1945, under a malicious Communist regime, and with an illiteracy rate of 70% among the population, or with 100 years ago, when Serbia occupied Kosovo, one can say that this is now the peak of our democratic development. There is corruption and we must eliminate it. There are also signs of the old conflict with Serbia, but we are in a dialogue with Belgrade to normalise our relations as a precondition for European integration. Poverty is high but the people in Kosovo have an entrepreneurial spirit, and when you come to Kosovo, you will see that there is a vibrant society which is devoted to offering its families a better life. European Commission President Jean-Claude Juncker explained that “there will be no more EU enlargement within the next five years”. Is he shutting an open door here? President Juncker was describing reality when he said that there would be no enlargement within the next five years. I fear that it will extend much further than this deadline. For Kosovo, it is currently important to gain the right to freedom of movement in the Schengen Area, like all other citizens of Balkan States. One in four Kosovars already lives in the EU, whereas the absence of freedom of movement in the year 2015 simply generates a feeling of frustration among Kosovars. From Columbia to Moldova, states have the right to visa-free travel to the EU, and it is ironic that for Kosovars it is easier to get a visa for Peking than for Brussels. The EU states Spain, Greece, Cyprus, Romania and Slovakia still do not recognise Kosovo. Are there any signs that this may change soon? It is important that these countries do not block Kosovo’s European path. We have already made bilateral visits and maintain friendly relations with these states. It is important to notice that non-recognition of Kosovo is no longer a legal issue. According to the decision of the International Court of Justice, Kosovo’s independence does not violate international law and is thereby legal. We hope that the countries that have recognised Kosovo and that have the absolute majority would conduct a constructive dialogue with these countries to ensure a unified foreign policy of the European Union. How can one hope that Europe will adopt a common position on problems like the war in Ukraine, Russia or the Middle East when one cannot even agree on a much simpler issue like the general recognition of independence? In December, you explained that Kosovo is already de facto recognised by Serbia. “I do not think he is right about that,” said Serbian Prime Minister Aleksandar Vu?i? in response to your comment. “The Kosovar politicians are victims of this recognition/non-recognition rhetoric.” What does he mean by that? I think it is important that we not concentrate on the rhetoric in the media but, rather, on what we sign. Kosovo has signed a historic agreement with Serbia. According to our agreement, Serbia will respect the laws in Kosovo and not prevent Kosovo’s membership in the regional initiatives. This is a tacit recognition and it will not be long before Serbia formally recognises Kosovo and the Kosovar flag flies above our embassy in Belgrade. Austria recently agreed to support Kosovo in its hopes for international recognition. Do you regret the absence of such support from the German government? Germany has greatly supported the recognition of Kosovo and discusses this issue all over the world, with many countries and many organisations. I had very good discussions with German diplomats and they have always supported Kosovo. It is with great pleasure, that Kosovo recalls the generation of German diplomats that supported Kosovo – from Hans-Dietrich Genscher to Wolfgang Ischinger. Your ambassadors also help to deepen ties. German Chancellor Angela Merkel’s new initiative for regional investments in the Balkans is welcome and I will be the next host of the Balkan Summit on 25 March within the framework of the Berlin Process, where we will jointly promote investments in infrastructure. 30,000 Kosovars supposedly fled from their country in recent months. At the beginning of February, the German government explained that it would be “sensible” to make it clear to people, who are leaving the country, that there are social and economic prospects in their home country. Is your government doing too little in this respect? We were slow in understanding what happened and why so many people are now leaving their home. The law enforcement authorities in cooperation with Hungary, Austria, Germany and the EU have been able to stop this development. Countries like Germany should also reduce the duration of the deportation procedure, because Balkan citizens try to illegally enter those countries that have longer procedures. A few weeks ago, Kosovar migration to the West was close to the average among Balkan states. Apparently a number of rumours circulated in Kosovo that Germany was issuing work permits, and this created confusion and a sudden mass exodus. Kosovo’s Minister for Europe believes visa liberalisation will calm illegal migration. How optimistic are you that visa liberalisation will occur by spring of 2016? Some of the young people have entered the country because they are not able to visit their families. It is tragic in 2015 to have young people just a half hour from Vienna, who cannot see Europe. We must create legal possibilities for freedom of movement, as among all the other Balkan states. Kosovo has carried out 90% of the technical conditions to receive the right to freedom of movement and we hope to complete this process as quickly as possible. When will the Stabilisation and Association Agreement (SAA) between Kosovo and the EU be signed? The signing is already late. Many months ago we consolidated the wording of the agreement with the EU, and I believe we must sign it before summer. Kosovo reached an agreement with Serbia over normalisation in 2013, and every delay to integrating Kosovo will have effects on the stability. How can we convince the citizens of Kosovo that it is a natural integral part of Europe, if we have incomprehensible delays in the first steps of integration?